Syrian government and opposition delegates warned of the impact on negotiations at peace talks in Geneva after a day of violence in Syria that included jihadist suicide bombings and missile strikes by the air force. The United Nations opened the peace talks with a symbolic ceremony on Thursday in Geneva, attended by representatives of the warring sides. But there has been no further direct contact with UN mediator Staffan de Mistura, who is still trying to get agreement on how the talks should be arranged. With tensions palpable among participants, the United Nations is treading carefully in its efforts to revive negotiations after a 10-month hiatus. Suicide bombers stormed two Syrian security offices in Homs today, killing dozens with gunfire and explosions including the head of military security, prompting airstrikes against the last rebel-held enclave in the western city. The jihadist rebel alliance Tahrir al-Sham, which opposes the talks - although it has fought alongside factions that are represented there - said that five suicide bombers had carried out the attack. It stopped short of explicitly claiming responsibility. Tahrir al-Sham was formed this year from several groups including Jabhat Fateh al-Sham, which was formerly known as the Nusra Front and was al Qaeda's Syrian branch until it broke formal allegiance to the jihadist movement in 2016. Warplanes also carried out six raids on Douma in the eastern suburbs of Damascus, resulting in six deaths, and earlier, an air raid in Hama killed four people from the same family, the Syrian Observatory for Human Rights said. 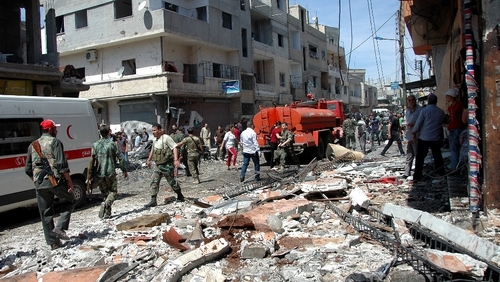 Syria's UN envoy Bashar Ja'afari said the attack in Homs had been a message aimed at the Geneva talks and that it would "not pass unnoticed". Although Mr Assad's government has controlled most of Homs since 2014, rebels still control its al-Waer district, which warplanes bombed today, wounding 50, the Observatory said.